It’s always nice at this stage of the season to open up the doors to the supporters and find out what they’ve made of our summer. So let’s see what they’ve got to say. Ungrateful bastards. I usually feel quite nervous at the start of the season, reluctant to play the first game in case it all goes wrong. I’m especially nervous when I have to go away to one of the biggest clubs in the league. But ahead of the season opener against Liverpool, I feel strangely calm. Don’t tell my wife, but I’ve put around eight real hours into this pre-season. I’ve cleared a forest of dead wood from the squad and put a fortune in the coffers. In Gianluigi Donnarumma, Jose Gaya and Sandro, I’ve bought three players who all improve my squad. 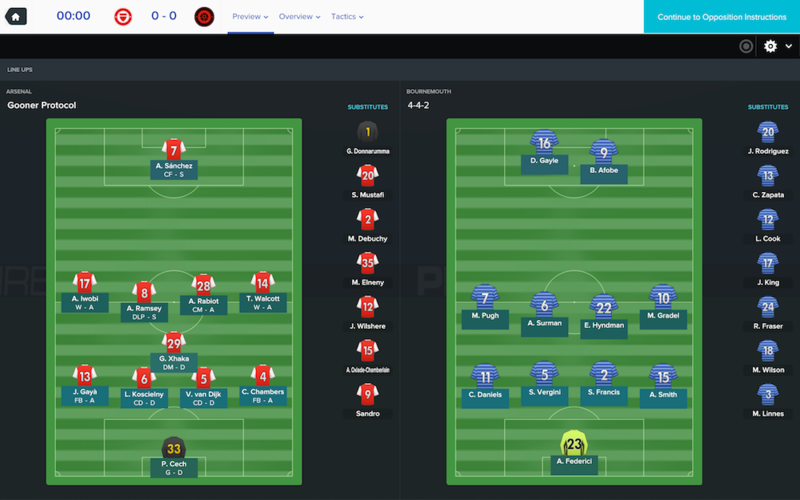 In Jack Wilshere, Calum Chambers and Chuba Akpom, I have three returning loanees with something to prove. 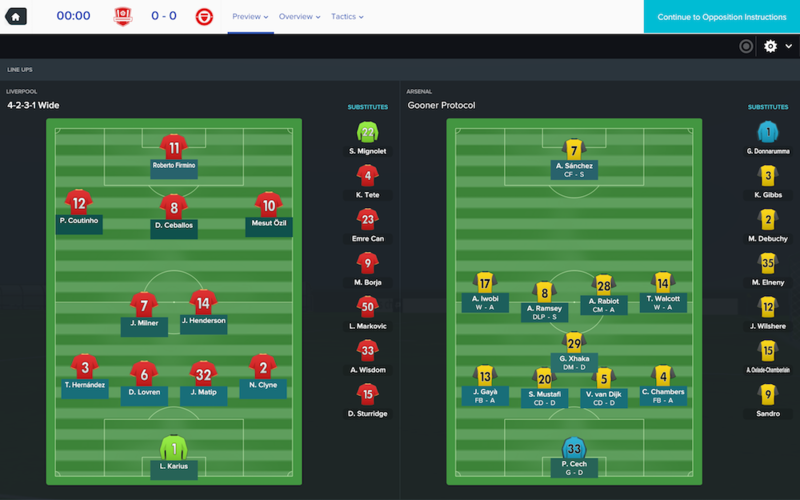 I’ve completely overhauled the coaching team and I’ve set individual programmes for every player. I’ve left the scouting to director of football Arsene Wenger and he seems happy with that. I don’t want to tempt fate, and I rarely need to, but we look in really good shape. I just hope that Liverpool’s new signing Mesut Ozil doesn’t finally impress me. We’re not at full strength though. With Danilo and Laurent Koscielny suspended, it’s a bit of a different backline. There’s a choice to be made at right-back where I eventually opt to give Chambers’ superior pace a go ahead of Matty Debuchy’s experience. On the night before the game, Santi Cazorla injures himself and so Aaron Ramsey comes back into the middle as well. We’re three first team players short, but we still look good. Not that good though. At some point in the future, I’m going to whine that we dominated a game, made all the chances and still managed to lose. And then someone’s going to remind me of this match and I’ll have to sit down and shut up. We started really well and opened the scoring early when Adrien Rabiot slipped one through to Alexis Sanchez. After half an hour, we were two goals to the good, this time it was Rabiot who finished, converting a cross from the coruscating Chambers. And then we just…stopped. Without warning, we downed tools. We couldn’t string two passes together, we weren’t making the runs for the counter-attacks, we just went all England. Liverpool capitalised and *obviously* Ozil played a part in their fightback, lofting a delightful ball over the back line for Roberto Firmino to spank home. I gave a stirring speech about complacency at half-time, but it did no good. Theo Walcott, after a season of playing dangerous low crosses in from the right, unilaterally decided to try lofting them in high instead. Strangely, Sanchez was unable to reach them. Changes were made, but to little effect. Liverpool continued to make chances, hitting the post and forcing a string of saves from Petr Cech. My only recourse was to switch to my defensive Castle Protocol and hope to hold out. It worked, but only just. Liverpool should have drawn that game and, to be honest, we could have had no complaints if they’d won. 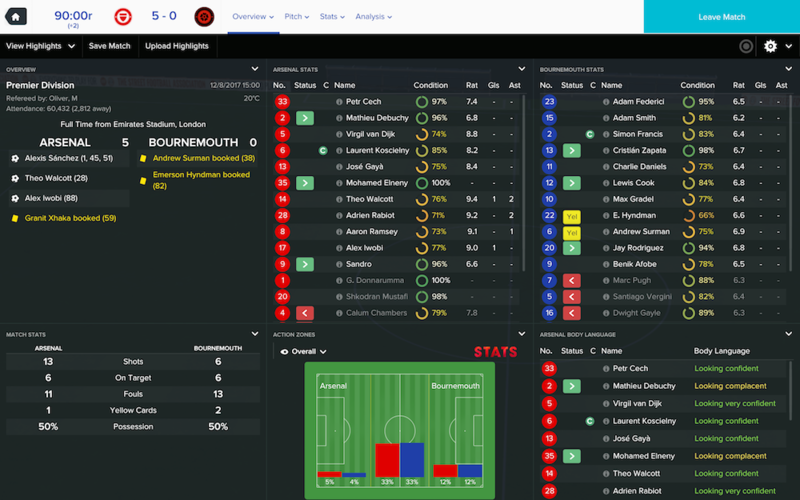 I expect far better at home to Bournemouth, who look one of the weakest sides in the league. They’ve got bags of pace up front, which is enough to dissuade me from the high line, high press, high energy Klopp Protocol, but they’ve not got much else. From watching their 0-1 defeat to West Bromwich Albion, I’ve also noted that they defend corners with Charlie Daniels (5ft10) and Emerson Hyndman (5ft8) at the near post. I duly set up a corner routine that floods that zone with my tallest players and I direct everything there. After the state of that Liverpool performance, I don’t want to take any chances here. It’s an unchanged team because, for the moment, I’m prepared to accept that it was just an off day. Yes, that’s much more like it. Nothing soothes the nerves like a goal inside 35 seconds and obviously it was Sanchez who scored it, thanks to a lovely pass from Rabiot. The Frenchman soon set up another, this time teeing up Walcott. Pleasingly, the third goal came from a corner, Daniels clearing the ball only as far as Ramsey, who smashed in a shot that hit Sanchez in the face and went in. Sanchez brushed off the pain to claim the goal as his own and, frankly, I’m happy to let him have it. Bournemouth were dead in the water now, Sanchez completed his hat-trick in the second half before making way for Sandro, and Iwobi added another before the end. I have no complaints whatsoever. Today was a good day. Watford battered West Brom last weekend, but only after the Baggies were reduced to ten men. They lost their opening game at home to Swansea. They seem to have a weak spot on the left side where wing-back Park Joo-Ho has pitiful strength and poor off the ball numbers. If we can exploit that, we should do all right. We can’t play Klopp Protocol because of Yussuf Poulsen’s electric pace, but we should be okay with Gooner. We will remain unchanged. Sanchez had a knock from the Bournemouth game, but he’s shaken it off. Sandro, who has scored three times in two games for the U23 side, sits ready on the bench just in case. Sometimes you lose because you’re unlucky. Sometimes you lose because your players are incompetent. But sometimes you lose because you’re an incorrigible idiot and your own worst enemy. Today falls into the latter category. 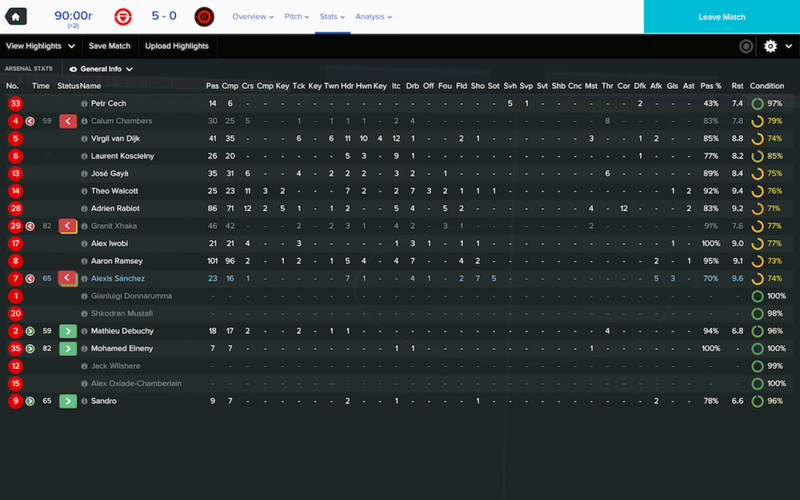 And so ends a 29-game unbeaten league run. I’ve never enjoyed a good record against Watford. Playing a lone striker, even someone as incredible as Sanchez, doesn’t often work against a back three, and so it proved here. The first half was a lesson in cancelling each other out. The second half was initially better for us, but only for a short time. Roberto Pererya’s outstanding pass allowed Troy Deeney to open the scoring on the hour. 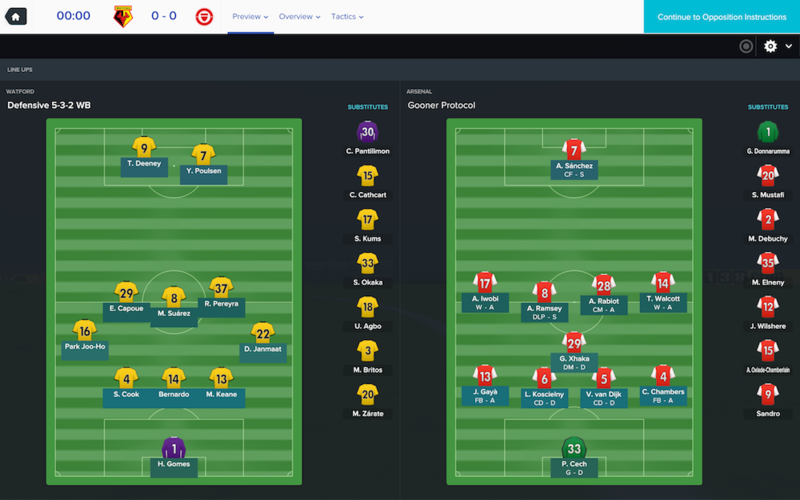 Satisfied that none of my plans had worked (Park Joo-Ho played like Paolo Maldini), I switched to the Klopp Protocol and brought Sandro on for Xhaka, playing something close to a 4-2-4. 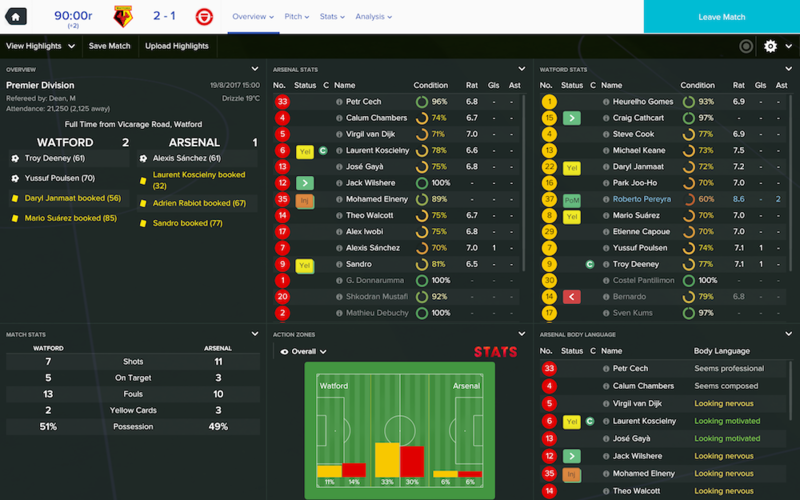 We equalised from the kick-off through Sanchez, obviously. And it was here that I made my error. I should have gone back to Gooner Protocol. I should have been happy with a draw away from home. I know not to play a high line against teams with quick strikers. It’s something I’ve learned the hard way on several occasions. And yet, emboldened by the speed of our equaliser’s arrival, I decided to leave them in that shape for a little longer. Just to see what happened. Can you guess what happened? Of course you can. Pereya picked up the ball inside his own half, lifted it up over our hopelessly advanced defence and Poulsen meep-meeped into the penalty area to crash the ball past Cech. We fought on and we fought hard, Sanchez put a crack in their crossbar, but it wasn’t enough. I speak to the players, I speak to the press and then I lock myself in a toilet cubicle and stab myself repeatedly in the leg with a plastic fork. 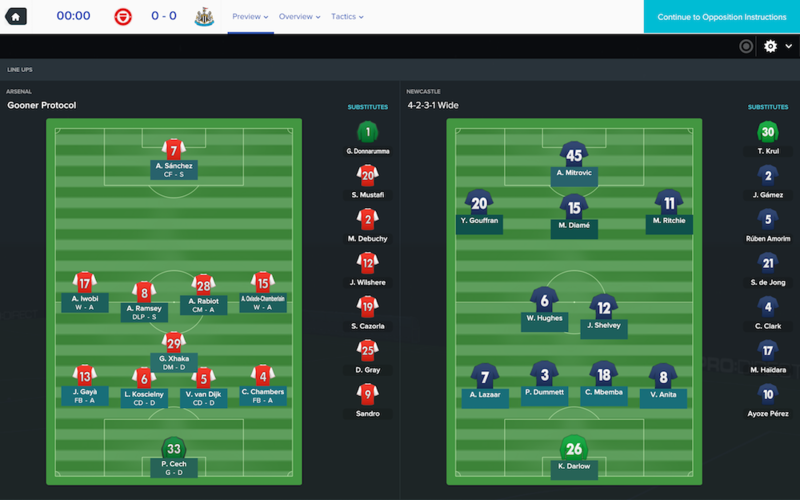 An opportunity to quickly get back on track presents itself in the form of Newcastle United, back in the Premier League but without a win in their first three games. And I’m not surprised. They’re particularly weak at the back where Paul Dummett has been filling in as centre-back with little success. Worryingly, however, we look less capable of capitalising on that than you’d expect. Last season we were far and away the leaders in the cross completed category. 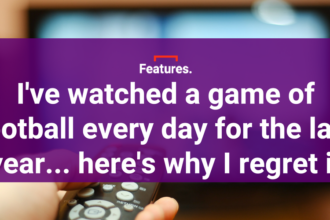 It’s what we do. 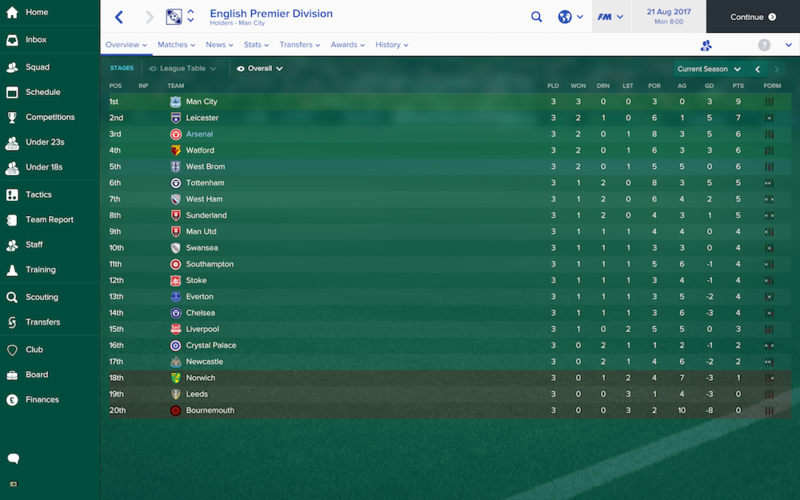 This season, and I know it’s still early, we’re 17th. Our crossing has been terrible, mainly because people keep hitting them high instead of low. 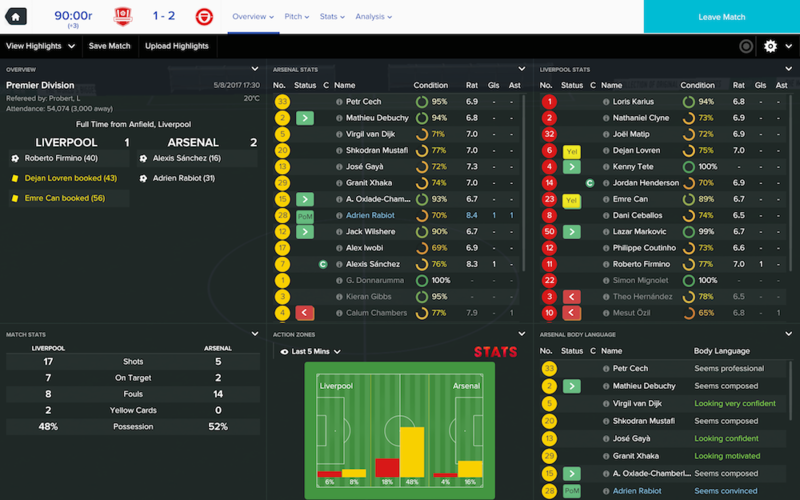 I was going to give the wingers one more chance, but then Walcott injures himself and makes the decision for me. Welcome back to the team, Alex Oxlade-Chamberlain. And that is the sort of football I expect from this lot. There were a few nervous moments in the first half when we rattled up so many missed chances that I wondered if this would be the karmic reducer I was expecting after the Liverpool game. Not today. 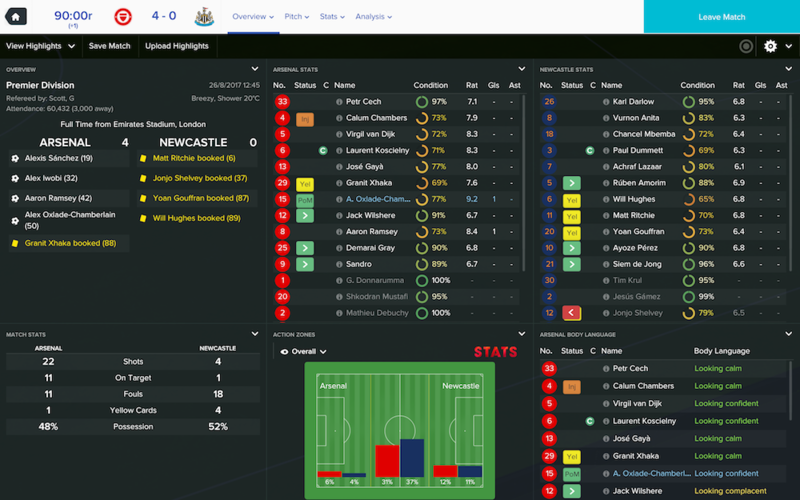 We absolutely battered Newcastle with goals from Sanchez, Iwobi, Ramsey and the excellent Oxlade-Chamberlain. We could have scored more, and this habit they’ve developed of lofting crosses rather than driving them along the deck is beginning to irritate me, but I’m not going to complain about a big win. For a brief time we go top of the table before Manchester City drop us back down to second. It’s a decent start. But Watford, bloody Watford. I’ll be dwelling on my mistake all season. Next month, we’ll have a chance to give Donnarumma his debut in the League Cup and we’ll also begin our Champions League campaign. 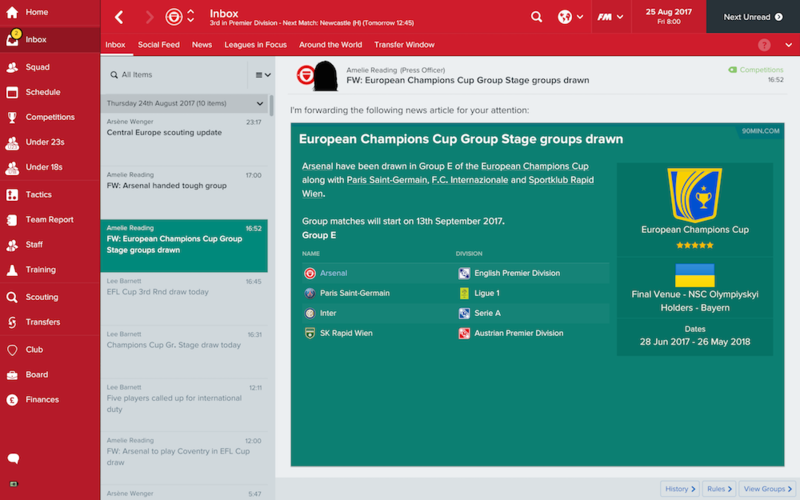 With the honour of a second seeding, I’m expecting a nice easy group and the chance to rotate the squad without fear of tumbling into the Europa League.